Why does hot weather make me crave something crispy and fried? The summer months call out for fried clam strips, chicken fingers, and french fries, hopefully eaten by the seaside with seagulls snapping at your nibbles. Really, whatever the time of year, I'm a bit of a sucker for a piece of fried chicken. Every once in a while, I'll go all out and and make butter-milk fried chicken, but it's an effort. This version checks all the crispy, crunchy boxes with about 50% less trouble. I have recently become quite obsessed with a spice blend called Dukkah, which is a middle-eastern blend of coriander seed and cumin, with a few other things thrown in. It's lemony and smoky at the same time and I've been putting it on everything. I thought I would try adding a big spoon to the breadcrumbs for this recipe and it worked well, but next time, I would give the two a whiz through a grinder or a food processor to combine them more smoothly. I gave the chicken breasts a good flattening with a mallet, I think it would have been better if I had flattened them and then cut them into strips, which I think will help them brown more evenly. The chimichurri sauce is very very good with this. 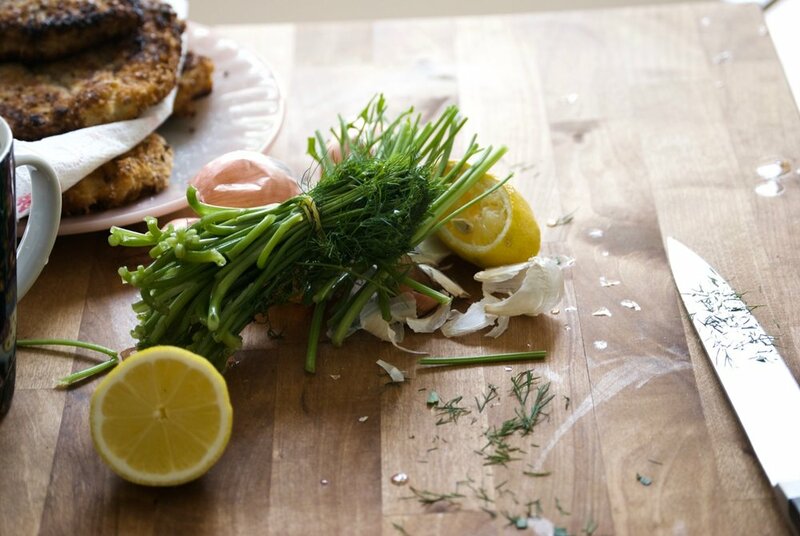 It's light and zesty and makes you want to keep eating until it's all gone. The other good news is that chimichurri takes about five seconds to make and tastes better the second day. May Summer last a thousand years. Cut the chicken into strips. Wrap the chicken strips in cling film and beat them to an even thickness. Beat the eggs in a shallow bowl. Put the four in a shallow dish with the salt and pepper. Whiz the breadcrumbs and dukkah in a food processor or coffee grinder and whiz for 20 seconds. Then transfer to a plate. Heat about 1/2 an inch of oil in a cast iron pan. The oil needs to be smoking hot, and this can take about 10 minutes for it to get there. 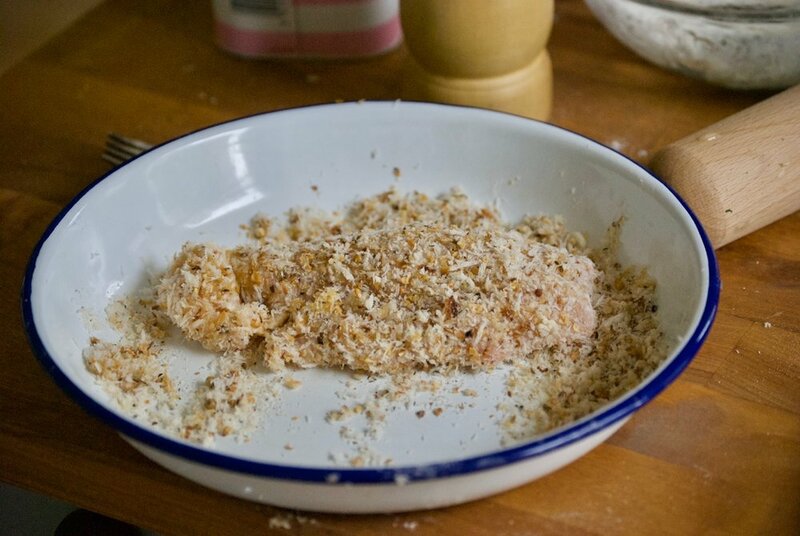 While the oil is heating, take your chicken strips and dip them in the flour to cover them, then dip them in the egg, and finally the bread crumbs. Transfer to a plate. 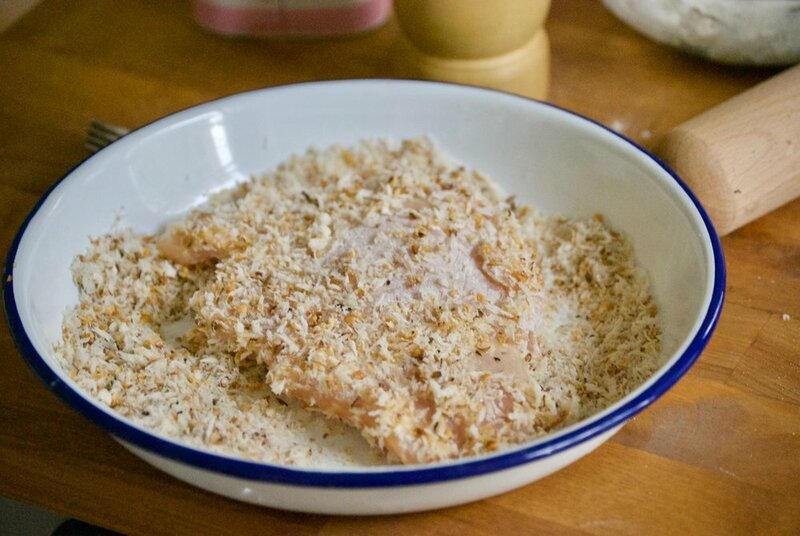 Repeat flour, then egg then breadcrumbs until all of your strips are coated with a nice layer of crust. Slide the strips into the hot oil in batches of 2 or 3. Flip after 4 minutes on the first side. When fully brown, transfer to a plate with paper towels and keep in a warm oven. De-stem the parsley leaves. 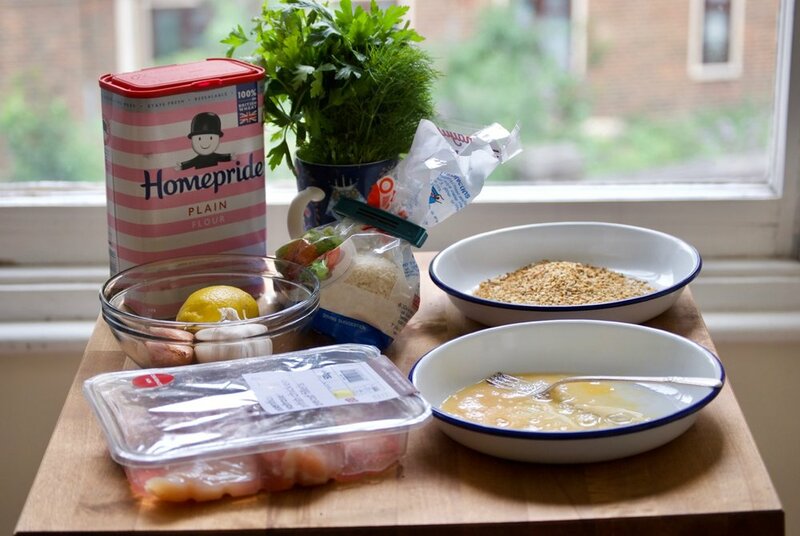 Pack into a food process with the rest of the ingredients. Run until all ingredients are combined. 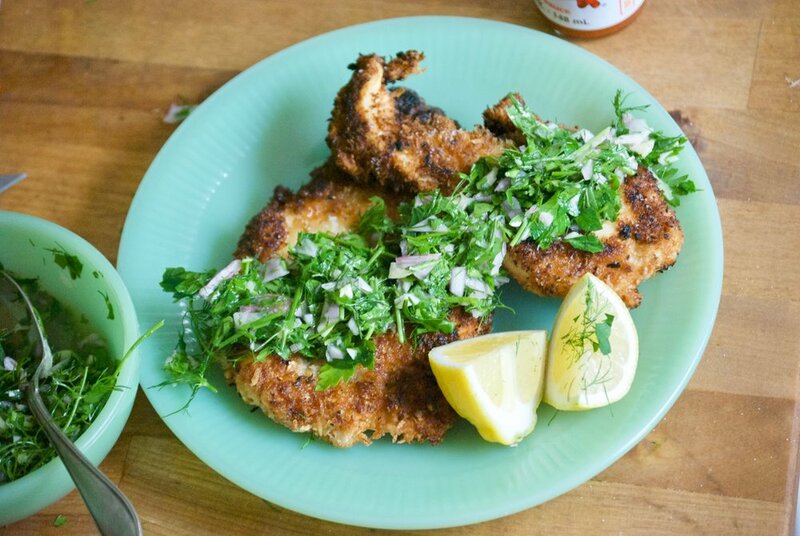 Serve with fried chicken strips, lemon wedges, and hot sauce. If you want a cooler edge, serve with sour cream or greek yogurt.